Once again, the Commission has been involved in a number of solid waste management issues, some old and some new. Building on our 2003 success of creating the Waste Tire Management and Recovery Program, we continue to monitor that program’s implementation. The FY 2004-5 Budget has proven to be a significant challenge for the Legislature as we debate the contentious issues of Education aid reform. The Assembly continues its advocacy for preserving critical funding for education, health, environmental conservation and other programs. This Commission has again focused attention on the need to renew last year’s funding increases for the Environmental Protection Fund recycling programs. You will find a more detailed discussion of the environmental impacts of the Budget in this newsletter. The Commissions also submitted comments on the NYS Public Service Commission (PSC) proceeding to define a Renewable Portfolio Standard for public utility investment in renewable resources. Naturally, the key issue is the definition of “renewable resources,” which some contend should include waste-to-energy plants. I believe that these facilities are inconsistent with the concept of renewables (such as wind and solar energy) and should not be included. I have also introduced legislation addressing this issue. Excerpts from my letter to the PSC are in this newsletter. We have worked closely with the Assembly Legislative Commission on Toxic Substances and Hazardous Wastes, Chaired by Assemblymember David Koon, to achieve passage of the bill eliminating the use of burn barrels. For seven consecutive years, the Assembly has passed this bill, while the Senate has failed to act. This issue is discussed further in the Newsletter. Several other Assemblymembers joined me in submitting comments to the U. S. Nuclear Regulatory Commission on their proposed environmental justice policy for proceedings before the NRC. Most controversial was the NRC proposal that racial motivation and fairness or equity was not to be considered within the context of socioeconomic impacts to be addressed under the National Environmental Policy Act (NEPA). We have urged the NRC to reconsider its proposal and to more actively involve the public in the development of a new draft policy. I have joined Assemblymember Steven Englebright (former Toxics Commission Chair) in sponsoring legislation that would allow local governments to regulate lead testing and remediation more stringently than the State Fire Prevention and Building Code without approval of the State Building Code Council. We continue our advocacy for the proper management, reuse and recycling of electronic equipment, including computers, televisions, and wireless telephones. The Assembly continues to work on the expansion of the beverage container deposit law to include other types of beverages. I have also included a copy of my op-ed article on the status of New York City recycling efforts. We are actively working on the annual edition of Where Will the Garbage Go? Other issues occupying the Commission this year include new legislation regulating labeling and disposal requirements for mercury-containing products and a prohibition against brominated flame retardants. We have commented on the EPA mercury emission rule and monitor DEC’s consideration of revising the Part 360 regulations. I hope that you enjoy this publication and find it interesting and informative. Please feel free to contact my office with your comments and concerns. You’ve seen them in farm fields across the State – round hay bails covered in plastic sheeting. Plastic tarps are used to cover fields and reduce weed production, in addition to numerous other uses of agricultural plastics on farms. At the Assembly public hearing on the prohibition of open burning of solid waste in New York State (reported in this Newsletter), one of the major concerns discussed at the hearing was the open burning of agricultural plastics and the associated health and environmental problems. Open burning of agricultural plastics constitutes a fire hazard and releases large amounts of toxic pollutants, including dioxins, which can cause dangerous health effects such as cancer and respiratory distress. The testimony of Dr. Lois Levitan, leader of the Environmental Risk Analysis Program of Cornell University, focused on improving the use and disposal of agricultural plastics to protect public health and the environment. Cornell’s College of Agriculture and Life Sciences is working to assist in the development of an NYS infrastructure for the recycling or disposal of plastics off-farm rather than dumping or burning these materials on the farm. Economic, technical, and cultural difficulties need to be resolved in order to implement a successful program in New York , such as those in neighboring states and Canada. Research on the quantities of plastics used in various sectors of New York State agriculture, their sources and specifications, and cost to farmers for their use and disposal. Coordination between agricultural plastic product manufacturers and the re-processing sector to mesh specifications in product design with the parameters required for recycling and reprocessing. Development of an infrastructure for collection and transport of used materials. Dr. Levitan has recently submitted a proposal to USDA Northeast Sustainable Agriculture Research and Education Program for a collaborative project: “Recycling Agricultural Plastics: Developing a Sustainable Infrastructure”. This project, if funded, would facilitate a needed agricultural plastics recycling in New York State. April 19th marked the Assembly’s Legislative Earth Day. For seven consecutive years, the Assembly has approved legislation that would substantially limit the open burning of solid waste across New York State (A.5884 Koon, Colton et al/S.3340 Maziarz, et al.). The Assembly’s annual prioritization of this bill reflects the increasing body of evidence of the dangers posed by open burning of waste. “Burn barrels” are frequently used for the purpose of burning solid waste. New York State environmental regulations currently allow the burning of waste to occur in towns with populations of fewer than 20,000 population. The “burn barrel” bill has broad support from a many groups, including solid waste management groups, environmentalists, mayors, health professionals, firefighters, casualty insurance companies, as well as individuals across the State directly impacted by emissions from burn barrels. The NYS Department of Environmental Conservation has expressed strong support for passage of this bill. Recent surveys indicate that the practice is becoming more prominent in some communities. A recent US EPA report, prepared in cooperation with the NYS Departments of Health and Environmental Conservation found that burning 3 to 11 pounds of household waste in a burn barrel is equivalent to the burning of 200 tons of household waste in a modern, well-controlled incinerator. While few waste management options are pollution free, emissions from open burning are thousands or tens of thousands of times greater than from permitted waste management facilities. Smoke from open burning of waste frequently includes significant amounts of over 20 dangerous pollutants, including benzene, particulates, PAHs, lead, arsenic and mercury which can damage the respiratory system, nervous system, kidneys, and liver of those exposed. Harmful toxins emitted from the open burning of waste, including dioxins, are generated in significant amounts due to the low combustion temperatures and poor air distribution inevitable in open burning devices. Open burning of solid waste has been identified by the United States Environmental Protection Agency (US EPA) as the largest quantified source of dioxins. The toxicity of dioxins, even at extremely low levels, has been linked to serious health problems in humans, including cancer and adverse developmental and reproductive effects. Dioxins emitted by open burning can migrate significant distances and can accumulate in the food chain, contaminating meat, dairy and other agricultural products, as well as wild game consumed by humans. Contact Senator Joseph Bruno and your State Senator and request that they pass this bill. Contact the Governor’s Office, requesting his support for the bill and asking that he urge the Senate to pass the bill. In the absence of Senate action this year, the Governor should direct DEC to amend their regulations removing this dangerous loophole. The Environmental Protection Fund (EPF), created in 1993, provides funding to municipalities, businesses, not-for–profit organizations and the State for projects that protect the environment, public health, safety and welfare of New Yorkers. The EPF funds solid waste management initiatives such as waste reduction, recycling and landfill closures. The EPF has provided grant money for local and regional waste reduction and recycling efforts under the “Municipal Recycling” and “Secondary Materials Markets and Waste Prevention” categories. The Governor’s FY 2004-05 Budget proposed $5 million for each of these programs. Over the past several years, the Assembly has proposed more than the Governor for the EPF recycling programs, which in the last three years resulted in final appropriations greater than the Governor proposed. The Assembly reached a budget agreement with the Senate. The Governor has made a number of significant Budget vetoes; however, the EPF was not affected. Because nearly all of the old municipal landfills have been properly closed, appropriations for landfill closure have diminished greatly in recent years. Most of these municipal landfill closures received matching funds from the EPF and/or the Clean Water/ Clean Air Bond Act of 1996. * In FY 98/99, an appropriation of $6.25 million was enacted by the legislature for Secondary Materials, but $.25 million was vetoed by the Governor. The U.S. Environmental Protection Agency (EPA) estimates cell phones will be discarded at a rate of 130 million per year by 2005, resulting in 65,000 tons of waste. The Agency’s estimate of the total electronics waste entering landfills each year is nearly 2.1 million tons. Chairman Colton has introduced two bills to address the rapidly growing dilemma of wireless or cell phone discards. A 3075B Colton, Englebright, et al/ S 903B, would require retailer sellers of wireless telephones to accept such phones back at no cost for recycling or reuse and prohibits the disposal or incineration of a wireless phone. A 3770 Colton, Koon, Englebright, et al: would prohibit the sale of disposable cell phones and establishes a civil penalty for violations. A 2003 Report issued by INFORM (a not-for-profit research organization) “Calling All Cell Phones” cites the Cellular Telecommunications & Internet Association (CTIA) statistic of 140.8 million cell phone subscribers in the US in 2002. That number had grown by 10 million or more each year since 1994 and is expected to exceed that trend over the next several years. Although many old phones may be temporarily stored away in closets and drawers, eventually they will enter the waste stream or preferably recycling collections, as fast as the retired phones going into storage spaces. How Many Wireless Phones are Recycled by Industry? The INFORM Report indicates that, notwithstanding the more than 100 million phones estimated to be retired annually, the industry’s collection programs it reviewed had collected no more than 2.5 million. The Commission spoke with a group of carriers who indicated that cell phone collections continue to increase since INFORM’s Report was released. AT&T Wireless – Consumers and businesses are invited to participate in the recycling of used wireless phones, accessories and batteries, regardless of the manufacturer or carrier, with proceeds of recycling wireless phones, batteries and accessories donated to “Keep America Beautiful”. Equipment is accepted at any AT& T Wireless retail store and AT&T will pick up unwanted wireless phones and accessories from businesses. No information available on collection numbers or money donated. Bluegrass Cellular – Consumers are encouraged to bring their used wireless phones to any Bluegrass Cellular Customer Care Center to generate funding ($1 per phone) for the United Way of Central Kentucky. No information available on collection numbers or money donated. Cingular Wireless – Customers are encouraged to bring old units and accessories that will be refurbished and either 1) donated to battered women’s shelters, 2) sold or warranty-exchanged to customers as refurbished, or 3) sold to 3rd parties for secondary market utilization as phones or for parts recycling. Cingular also collects spent rechargeable batteries at all locations for the RBRC (Rechargeable Battery Recycling Corp.) program, which accepts them back to recycle into new rechargeable batteries. These services are available to any wireless customer, not just Cingular customers. No information provided on collection numbers, re-sales or donations. CTIA – The international association for wireless phones, Cellular Telecommunications & Internet Association, has a program called “DONATE A PHONE” that recycles used cell phones, raising funds for a variety of charities. They have collected over 2 million cell phones, creating over $5 million in charitable support. Midwest Wireless – The company collects used phones and accessories at every retail location and sells them to be re-furbished or recycled, claiming they do not dispose of this equipment. Midwest raises funds in its sale of phones for local charities. No information provided on collection numbers, sales or money donated. Nextel – The company collects used cell phones at their retail stores or buys back phones via internet or mail-in. The company sponsors the Red Cross “Donate-a-Phone” program and forwards proceeds they get from used phone donations to American Red Cross Armed Forces Emergency Services program. No information provided on collection numbers, donations or money donated. Sprint – The company runs Sprint Project Connect which collects old cell phones at Sprint Stores and Easter Seal location and sells them for re-furbishing. The sales generate funds for over 54 million disabled Americans (Easter Seals and the National Organization on Disability). The company claims to recycle older, obsolete models in “an environmentally sound manner.” No information provided on collection numbers, re-sales or money donated. T-Mobile – The company website describes a take-back program in Europe, but no information is available on take-back programs in the U.S.
Verizon Wireless – The company has used its cell phone recycling collections for nine years to benefit its HopeLine program. The company collects cell phones from any wireless carrier at all Verizon Wireless stores to be refurbished, recycled, and/or sold. HopeLine has donated wireless phones and airtime, as well as monetary and other contributions to domestic violence shelters and prevention programs across the country. In 2003, Verizon Wireless collected 900,000 wireless phones for recycling.” Verizon also collects spent rechargeable batteries at all locations for the RBRC program to recycle. No information on re-sales or money donated was provided. While apparently experiencing recent growth, the collection programs obviously still comprise a small portion of the retired phones. The current challenge is to encourage cell phone users to return used phones to the retailers for recycling, refurbishing and reuse. In late March, Chairman Colton wrote to Mayor Bloomberg regarding NYC electronics recycling and the former Waste Prevention Coordinators program administered by INFORM, Inc.’s Waste Free NYC. Colton called on the Mayor to consider future funding for the Waste Free NYC program to continue promoting electronics collections events in each local Community Planning Board. The City responded to the Colton letter, explaining that consistent with the concept of manufacturer responsibility for recovery, reuse or recycling of consumer products, the City is working with Dell Inc. and the National Recycling Coalition. The goal is to establish a City-wide program to collect and recycle used computer equipment. Likely drop-off sites throughout the five boroughs have been identified and collection events are anticipated in early October. The City also explained its education campaign through a web site and exchange program. Chairman Colton responded to this positive initiative and urged the City to establish this initiative into a regular, reliable electronics collection program that encourages refurbishing, reuse and recycling of these components. Colton sees these efforts as providing promising economic opportunities for the City. Mercury is a metal that can damage the nervous system and kidneys at high levels. Short-term exposure to high levels can cause shortness of breath, chest pain, nausea, vomiting diarrhea and other problems. Exposure to mercury can occur by inhalation, skin absorption and ingestion. Children are particularly vulnerable because their nervous systems are still developing. According to the Department of Health, health effects in children might include brain damage as well as behavioral and developmental problems. establishes enforcement provisions for violations. In May, Chairman Colton sent a letter to the NYS Department of Environmental Conservation (DEC) on the preliminary draft Standards for the Management of Elemental Mercury and Dental Amalgam Wastes at Dental Facilities. These regulations were prompted by a law passed in 2003 requiring the recycling of mercury in dental facilities. Recent data shows that the use of mercury in dental operations is increasing, rather than decreasing. Chairman Colton urged DEC to continue to include the use of amalgam separators as a mechanism to reduce the release of mercury into the environment. There has been pressure from dental professionals to remove this requirement, which Colton believes is essential to successfully capture and recycle mercury. The Assemblymembers voiced their deep concern that New York would commit itself to comply with such procurement conditions, which fly in the face of policies that have already been enacted in New York State. They called on the Governor to immediately withdraw New York State from the list of concurring states. Since actions on agreements such as the Free Trade Area of the Americas (FTAA), the Central American Free Trade Agreement (CAFTA), the South African Customs Union and other bilateral trade pacts around the world are imminent, this action must occur in a timely manner. The Assemblymembers also requested the Governor to provide the Legislature with the Bush administration request for State concurrence, so that it can be reviewed. The Assemblymembers further stated that they believe setting procurement policy is within the purview of the Legislature, and that public review and hearings are appropriate before the State considers supporting any such conditions. No reply has been received from the Governor’s office at this time. policies that prohibit purchases of goods made in sweatshops or goods made with slave labor. I am writing regarding the Public Service proceeding to establish a New York State Renewable Portfolio Standard that would require 25% of the State’s energy to be derived from “renewable energy” sources by 2013. Of particular concern to me is the type of energy production that might be considered “renewable resources”. I strongly urge the Commission to exclude municipal solid waste incineration from the Renewable Portfolio Standard. Including garbage burning in a Renewable Portfolio Standard will significantly displace truly clean energy sources such as wind, solar and other “clean” energy systems. There is limited growth capacity under the proposed 25% Renewable Portfolio Standard – only about 6%, due to the eligibility of in-place energy sources (e.g. 17% from hydropower). The limited growth capacity argues for new growth to be focused on the cleanest sources, as these will provide the greatest environmental benefits. Considering garbage incineration to be a renewable resource flies in the face of existing New York State policy. Both the Governor and the Department of Environmental Conservation have rejected this concept. I personally led a community effort that defeated the re-opening of the southwest Brooklyn incinerator in my District. Garbage burning produces hazardous pollutants such as mercury, lead, dioxins, heavy metals. Existing plants have violated their air pollution permits, thereby creating pollution burdens on communities across the State. Incinerators also produce hazardous ash that must be disposed in a landfill, thereby concentrating these pollutants in communities where the landfills are located. These plants are often sited in highly-urbanized and poor communities that are already burdened with higher pollution levels and other industrial facilities. Of particular concern are children, who are more vulnerable to the impacts of pollutants. We are not talking of simply burning organic matter – incinerator feedstock routinely includes non-combustible materials (e.g. glass and metals) or materials produced through the exploitation and processing of non-renewable resources (e.g. plastics from petroleum). Incinerators rely on truly renewable resources or on materials that can be recycled and reused to maintain volume and heat value for sufficient combustion to produce their energy. Burning materials that should be recycled or reused can adversely affect recycling and reuse efforts. Incineration is simply not a renewable source of energy. We should be focusing our efforts on increasing recycling and reuse efforts and the development of clean sources of power such as solar, wind and other “clean” energy systems within New York State borders. Clean energy source development can have significant environmental and economic benefits for communities and the State – a point that has been made by both public interest groups and energy and research interests. I strongly urge the Public Service Commission to reject the inclusion of garbage incinerators in the definition of renewable resources for the Renewable Portfolio Standard. Following a proceeding which took more than a year, the PSC ALJ issued her recommended decision on the elements of a Utility Renewable Portfolio Standard (RPS). The ALJ found that a 25% renewable energy capacity goal by increasing the current 19.4% renewable energy capacity should be achieved by 2013. Further, the ALJ decided that New York should start its RPS by 2006, with review slated for 2008; specific eligible resources would be identified, but RPS parties would be allowed to develop other eligible options as they become viable and available. Eligible Renewable Energy Sources: The ALJ’s Decision included identification of renewable energy sources that would be eligible. Eligible energy options included biogas (from regulated landfills, sewage treatment plants, agricultural manure operations, and associated energy production technologies), fuel cells, solar, wind, tidal, hydropower (under 30 MW capacity from river flow and without water storage, under 10 MW with expiring contracts, and existing plant upgrades not involving new water storage), and biomass. Eligible biomass sources would be agricultural wood and plant residues, wood from regulated commercial harvesting, waste wood from forest management, (paper and lumber) mill residue, uncontaminated wood pallets, refuse derived fuel (RDF) from the untreated and uncontaminated MSW or C&D wood portion, sustainable biomass grown for energy production, and source-separated, uncontaminated ‘wood portion’ from urban MSW or C&D wastes. Ineligible Energy Sources: Some energy options were recommended to be ineligible, including coal gasification, nuclear power, combined heat and power (CHP) from natural gas, and hydropower over 30 MW from river flow and most significantly waste-to-energy (WTE) facilities. The Decision contains considerable discussion regarding the decision to exclude WTE at the present time as well as circumstances that might allow its inclusion in the future. Diversity: The Decision discussed how to promote certain developing renewable energy options and protect some existing small renewable energy resources. Exceptions are created for existing small hydropower (to protect them beyond their current contracts); customer-sited solar and wind up to 300 kW were supported through incentive grants (similar to NYSERDA’s System Benefits Charge (SBC) program). The high cost of these renewable sources merited this approach to encourage investment, rather than requiring them to compete with the large-scale contracts likely for other RPS options. Effective Date/Authority: The Decision recommended that only renewable energy developed after January 1, 2003 would be eligible, with the exception of wind and existing small hydropower with expiring contracts. The Decision also addresses the diversity of the RPS, how to handle energy imports, PSC authority and completeness of the record. A copy of the document is available from the Public Service Commission. The NYS Department of Environmental Conservation (DEC) has begun taking input for comprehensive revisions and enhancements of Title 6 NYCRR Part 360 regulations. The changes will include technical amendments, clarifications, and updates of regulatory language to match legal and policy developments at the State and federal level. Specific revisions are planned for solid waste management plans, landfill siting, landfill quality assurance and control, landfill monitoring, and C&D processing and recycling. DEC is considering expanding waste management to include auto dismantling, dredged materials, biohazard incident wastes, and flowable fill. DEC has asked its Departmental task forces on facility registration and C&D waste management for recommendations. The Commission will be following the regulatory developments closely to ensure that the necessary environmental and public health protections remain in force. 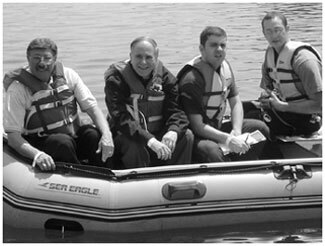 In May, 2004, the NYS Department of Environmental Conservation (DEC) held an initial stakeholder meeting on the Regional Greenhouse Gas Initiative (RGGI). RGGI is a cooperative effort by the 11 northeastern states from Maine to Maryland to design a program to reduce carbon dioxide (CO2) emissions from power plants in the region. The goal is to have an agreement in place by April 2005 that will provide a “flexible, market-based cap-and-trade” program for these states. Stakeholder meetings will be held throughout the region, in addition to the NYS meeting held in May. The plan is to achieve a 10 percent or moré reduction in CO2 emissions in 20 years, using 1990 CO2 emissions as the baseline. The baseline for the Regional or state plans would be those for which verifiable cost and emissions date would be available. State and federal reporting requirements likely would be considered adequate for data collection and monitoring. The May meeting specifically focused on CO2 emission reductions for power plants over 5 Mw capacity. Economic modeling of state and regional impacts is currently being done only for “known” impacts. For example, plans for incorporating renewable resources capacity after 2013 will not be included in the modeling. At the present time, neither a regional or a NYS CO2 emissions cap have been determined nor whether the cap can be reassessed at some future date. It also remains undecided whether the cap will be put in place by a date certain or phased in over time. The Commission will continue to monitor and interact with this process and will report on progress in the next newsletter. Last year, recycling collections were cut in frequency as a cost-saving measure recommended by the Mayor. This move followed the 2002 suspension of plastic and glass recycling, creating confusion, significant storage hardships and discouraging residential recycling participation. New York City is re-evaluating Local Law 19, the landmark legislation enacted in 1989 which established a long-term commitment to recycling. This law required the Department of Sanitation (DOS) to achieve specific tonnages of residential and institutional recycling representing 25-30 percent of the waste streams within five years and ultimately reaching the State’s recycling and reduction goal of 50 percent by 1997. Additionally, the City was required to implement leaf and yard waste collection, formulate a comprehensive market development strategy, and prepare annual recycling reports. While the City has not met the timeline goals in the law, it has achieved steady growth in recycling activity, resulting in a 20 percent recylables diversion from the DOS-collected waste stream by mid-2002. 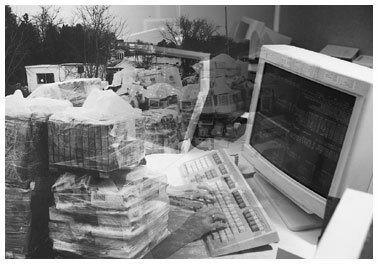 It also resulted in the current cost-savings of paper recycling, attracting businesses such as the Visy Paper and scrap paper dealers. This spring, at the urging of the City Council, DOS and the NYS Economic Development Corporation (EDC) issued a Request for Information (RFI) eliciting input for “New and Emerging Solid Waste Management and Recycling Technologies and Approaches” by May 24th. Proposals are under review by an independent consultant who will evaluate each technology and approach for its feasibility as a significant component of the City’s comprehensive waste management system. As the City develops a new long-term (20 year) solid waste management plan (SWMP) for the nearly 25,000 tons of municipal solid waste generated daily, these new technologies will be incorporated as appropriate and feasible. This approach brings opportunities for promising new technologies to make recycling and waste management more efficient over the next twenty years. Commission staff will monitor this process and report on any significant developments. As previously discussed, the NYC DOS is beginning preparation of a new long-term SWMP. While all City residents are waste generators and therefore affected by the planning process, some populations are more directly impacted of the Plan’s implementation. In particular, transfer stations can significantly affect life in many communities, creating problems such as truck traffic, odors, pests and dust. A series of public meetings was held citywide in late June to receive oral and written comments from residents on the SWMP Scoping Document. DOS will review the comments, summarize and respond to them in the final SWMP Scoping Document. Copies of the Draft Scoping Document and other related documents are available on the DOS website at www.nyc.gov/sanitation. Requiring tonnage offsets and site enclosures for new transfer stations in community districts with 20% or more transfer stations. Allowing expansion of existing facilities if they meet minimum distances from residential districts, hospitals, public parks or schools. Colton strongly recommended that expansion of facilities be covered under the same restrictions and requirements as the siting of new facilities. This would give greater protection to community neighborhoods that are already sharing a greater portion of the burden and address environmental justice issues in these areas. In June, Chairman Colton testified before the NYC Committee on Sanitation and Solid Waste Management in support of Resolutions 144 and 174. Resolution 144 supports the enactment of legislation expanding the State Returnable Bottle Law (Bigger, Better Bottle Bill) to include sport drinks, iced teas and botrtle water and returning the unclaimed deposits to the State to fund environmental programs. Colton also supported Resolution 174, which calls on NYC to enact and enforce a Zero Waste Policy. Through reduction of material inputs in manufacturing, packaging and other front-end processes, NYC can substantially eliminate the adverse impacts of garbage disposal, transfer stations and their associated problems, as well as costs of shipping garbage. Chairman Colton joins volunteers in Coney Island Creek Cleanup! In May, Chairman Colton participated at a community awareness event sponsored by the Urban Divers Estuary Conservancy and other groups for the Coney Island Creek. The Urban Divers is a non-profit grassroots environmental organization of scientific divers and waterway stewards committed to the restoration, conservation, protection, and public education of our rivers, oceans and marine wildlife; with a special focus on the restoration of the NY/NJ Harbor Estuary. These groups are committed to bringing life back to Coney Island Creek through restoration of lost wetlands at the extremely polluted headwaters of the creek. The event brought out many volunteers from the surrounding community who helped collect floating debris on the creek. Chairman Colton was very pleased and impressed with this successful clean-up event and is personally committed to proper restoration of the site. He believes that removing all the accumulated waste and debris will guarantee not only public safety and a cleaner environment, but will give back to the community this “forgotten waterway”. Waste Tire Recovery and Management Finally A Reality! In 2003, New York finally enacted the Waste Tire Management and Recycling Act, a program that has been priority legislation for the New York State Assembly for several years. The Act creates a fund dedicated to abating tens of millions of stockpiled abandoned waste tires and fostering markets for discarded tires. Stockpile Cleanup – is primarily the responsibility of the Department of Environmental Conservation (DEC). 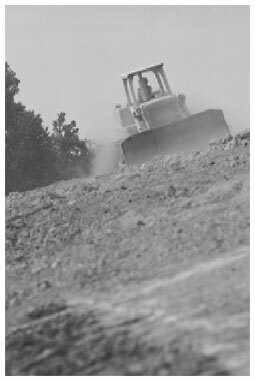 By Sept. 12, 2004, DEC is required to submit a statewide plan for abatement of all non-compliant waste tire stockpiles to the Legislature and the Governor, and to publish Requests for Proposals for the abatement. DEC is establishing arrangements with organizations to recycle waste tires into civil engineering projects (see the Department of Transportation discussion below) and other applications. The goal is establish viable uses for tires as the stockpiles are cleaned up to curtail their health and environmental threats. Market Development – is the responsibility of the Environmental Services Unit in the Department of Economic Development (DED). They are required to assist in the private market development of new reuse and recycling technologies for waste tires, promote recycled tire products, and prepare annual reports about markets for stockpiled and newly-generated waste tires. The NYS Department of Transportation, Thruway Authority, and Energy Research and Development Authority are required to pursue opportunities for reusing and recycling waste tires. The NYS Health Department is directed to study and report on the health impacts of the mismanagement of waste tires. The Governor has proposed expanding the waste tire fee to include new motorcycle and ATV tire sales and has recommended $18 million for this year’s waste tire program implementation.